Think of all the time you spend putting up and taking down your exhibit. Think of how many more important things you could be doing the day before and after your show starts. Think of all of the time you spend worrying if your items will arrive safely. That’s a lot of time. We handle the logistics so you have time to handle what really matters at trade shows. Think of us as your trade show concierge for exhibit storage, maintenance, inventory management, transportation and much more. From the design and production of exhibit material prior to an event, to the cleaning and packing of material at show’s end, Purpose1 offers our customers full-service display logistics. Maybe it’s not the complexity of your display that presents challenges, but the number of individuals who need access to something as simple as a banner stand that can be a logistical nightmare. Go make that big sale, with Purpose1 as your Tradeshow Concierge. Our Tradeshow Concierge service is here for you. Give us a call at 1-800-318-9070 or contact us here. Plus, get a free Exhibit Services Review! 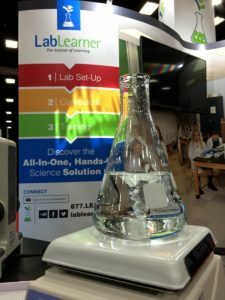 Check out what we did for our client, LabLearner. We think you will be impressed! Why Purpose1 for Exhibit Management? Using a secure web portal, we effectively manage your exhibit material and make sure all items are accounted for at all times. We ensure that your branding and message is being shared consistently across multiple sales & marketing teams. We offer custom design and integration of new products and services by professionals familiar with your exhibition requirements as well as the standards of the trade show industry. We coordinate a consistent message to your specific target markets, including distribution of collateral and promotional items to accompany your exhibit. Rest assured that Purpose1 will ensure your display material returns after each event for inspection, cleaning and repairs as needed for quick availability. What does Purpose1 have to offer? Select a category below for more details! We’d love to show you how we can help with your exhibit and logistics needs.